Grunt Style Uses Outbrain to Drive 82% New Traffic. After some success with Facebook Ads and Google Adwords, Grunt Style’s agency, MuteSix, saw an opportunity to diversify where they were driving new customers and conversions for the brand. The agency, which specializes in customer acquisition and performance marketing, looked to Outbrain next. MuteSix’s content strategy for Grunt Style included American Grit, an online magazine and blog, targeting the brand’s audience. American Grit publishes two articles every day. To start, MuteSix selected a single piece of content from American Grit to amplify with Outbrain. Outbrain was then used to drive the discovery of Grunt Style’s selected content across its network of premium publisher sites to readers who were most likely to be interested in it, drawing on the discovery network’s sophisticated and proprietary algorithms. MuteSix worked with Outbrain to set up campaigns testing out different images and headlines for the same piece of content, and monitored and adjusted according to what performed best. The agency experimented with using both male and female images and chose photos of people in natural, All-American environments, to correspond with the content they were amplifying. MuteSix also created separate campaigns for platforms – desktop, mobile, and tablet – so they could optimize their creative and traffic sources accurately for each platform. Whereas they started with more generic campaigns, as they continued to test their content, they pivoted toward more male-centric and apparel-focused creatives, as it ultimately performed the best. One of Grunt Style’s biggest goals was to drive new customers to purchase their first product. Outbrain, which drove 82%* new traffic for the brand, was extremely successful at reaching and converting those who were new to Grunt Style. In fact, Outbrain’s results were so impressive, that MuteSix is now working on setting up retargeting campaigns for Grunt Style with Outbrain. The agency is also beginning to experiment with new creative ideas, including content specific to Grunt Style’s hunting and fishing collection and video content. 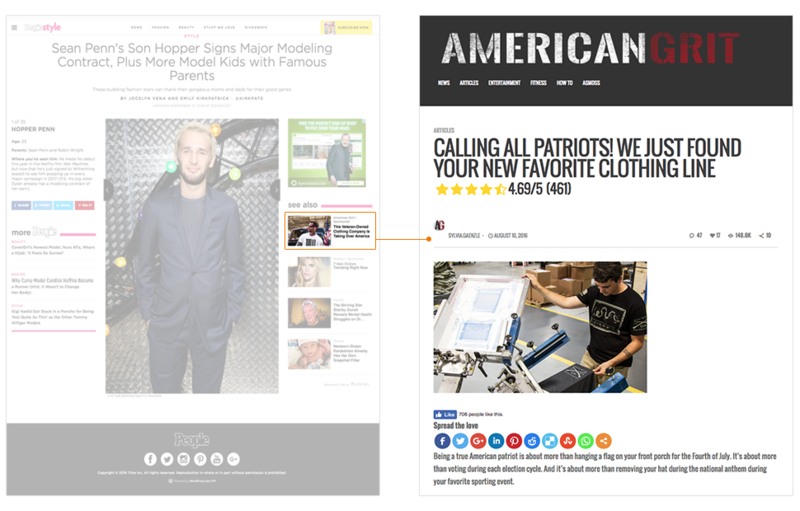 Outbrain has done a fantastic job with helping us reach new audiences and converting first-time purchasers.